Musicians who can read standard notation or tab sometimes neglect the task of learning music by ear. But learning by ear is a great way to develop your ear and extend your abilities further. The process of learning how to play a musical passage by ear is often called transcribing. This implies that the transcribed notes will be written down in some form. And you should definitely write down all of the music you transcribed, because if you don’t, you will forget it. First, let’s talk about prerequisites. Are you going to transcribe the music into tab or standard notation? You may find that tab is easier in the beginning, and this is a perfectly acceptable way to start. 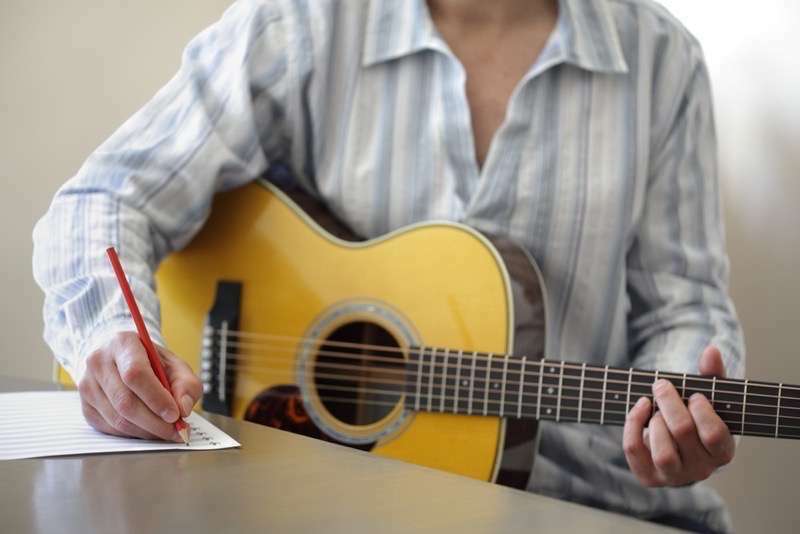 Although standard notation is a bit more formal, tablature is fine for transcribing guitar parts—especially those which you don’t plan to share, or which will only be shared with other guitar players. It is recommended, however, to use the tablature with rhythm stems form of notation. This is like a tab, except stems similar to those used in standard notation are drawn above the tab to indicate the rhythmic value of each note. Next, how is your ear training? If your ear is more developed, you will be much more effective at transcribing. Ear training is both a requirement and a result of transcribing, so you may be able to jump into transcribing even if you’re not confident in your ear training skills yet. Just make sure to pick tunes that are manageable for your skill level. Next, do you have a piece in mind of appropriate difficulty? You do not need to transcribe any piece in its entirety, but something does feel satisfying about transcribing a recording from start to finish. You should be able to guess pretty accurately at the difficulty of transcribing something just from listening to it. A piece will be easier to transcribe if it is slower, uses few special techniques and effects, follows basic scale patterns, consists of a lot of step-wiseA term used to indicate that a melody consists mostly of motion in steps. motion, and is made from simple rhythms. If the tune is fast, has a lot of difficult technique, uses weird scales, many leaps, and novel rhythms, it will be considerably more difficult to transcribe, possibly even for a seasoned transcriptionist. Your transcription skill generally is in lockstep with the difficulty of the music. If the passage takes a master guitar player to perform, it may well take a master transcriptionist to copy down. It is strongly recommended to take advantage of the many tools for transcribing. Attempting to transcribe without the appropriate tools is silly, and ultimately a waste of time. Tools exist to extend your capabilities. There are a number of ways to slow music down. Years ago, guitar players would play back the records at half-speed, but unfortunately this also changed the pitches. So they would have to learn it at a lower pitch and then move it up to a higher pitch. Today we have software that compensates for this pitch difference. Consider using Transcribe!, which will let you easily transcribe music and also bookmark points in the song. With this software, complex and fast passages can be broken down into smaller parts, slowed down to just 50% of the original speed, and played on loop again and again until learned. Although there is software available for creating notation and tab, and the printed result of this software is very high-quality, many players find it too cumbersome to use this software during practice, preferring instead the old-fashioned pencil and paper. Once you finish a transcription, though, you should scan it for safekeeping—maybe later you’ll want to enter it into some software and make a more attractive PDF. Start with an easy section of the song. Usually the melody is fairly easy to begin with, at least compared to more complex parts like guitar solos. Make sure your targetted section is reasonably short, consisting of one single musical statement. Grab that slow-down software, and play a loop. You should try to think in phrases, not in individual notes. While this may seem counterintuitive, thinking too much about individual notes will make it harder to transcribe. Of course sometimes you have to stop on one note and hum it and look for it on the guitar until you find it. But in general try to transcribe small chunks at a time. Slow the thing down. See if you can tap along with the rhythm. Sing along with it. Now find the first note on the guitar. Find the last note on the guitar. What range does this thing occupy, and where is the best place to play it? Now you’re ready to start working it out. What key is it in? What’s the root note? What scale does it use? Are any notes outside of the key? Separate rhythm from pitch as much as possible. If you’ve figured the rhythm out already, write it down in some form. If your understanding of rhythm is not strong, start by counting the notes and making an “x” marker above the tab to indicate all of the notes you heard. Now you can fill in the first and last notes, if you were able to find them. By the time you can do all of this, you should be ready to start guessing at the melody while playing the notes out on the guitar. Transcribing is inherently slow, hard and frustrating. Don’t underestimate the time it takes. When you are just beginning, you may only figure out a few notes in an hour. But you will get faster. If you find that transcribing is difficult, you may need to work on your ear training skills until you have gotten them up to par. Sing the notes as you play scales and exercises. Pick very simple melodies and rhythms and copy them to your guitar. Although transcribing helps you build ear training skills, there’s a chicken-and-egg paradox. If you find it difficult, dedicate time to building basic ear training skills. Transcribing is difficult but it is very important. It builds your ear training skills, and helps you understand when, how, and why to use certain melodic pieces over certain chords. In this way, it can help you to build your vocabulary, which will help you in improvisation, writing music, or learning new songs. Top improvisers often emphasize that transcribing guitar solos helped them learn to create their own.